US defence firm Raytheon has announced plans to open a second high-tech manufacturing facility in Scotland. 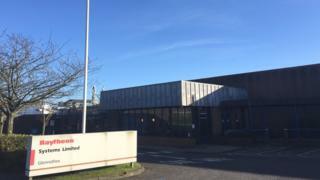 Raytheon UK said the 130,000 sq ft site in Livingston would help it develop power components for platforms such as armed vehicles and radar systems. It is expected to be operational within two years and serve customers in commercial and defence markets. Raytheon already operates a facility at Glenrothes, Fife, where it employs 700 people. The company has not said how many jobs would be involved in opening the new Livingston plant. Raytheon said its plans were part of its continued investment in Britain to create highly skilled jobs and diversify its technology portfolio in cyber intelligence, security, aerospace and defence. Raytheon UK employs more than 1,700 people across England, Wales and Scotland. The company has estimated that it contributes about £130m a year to the Scottish economy.